Healthy and Confident Singing Voice: Should I Sing in the Next Voice Recital? Benefits to Doing it! Should I Sing in the Next Voice Recital? Benefits to Doing it! "Should I sing in the next voice recital?" I often get asked. The answer is a resounding' "Yes!" Why Sing for my Voice Studio's Recital? There are many benefits! - An Opportunity to Share With Others: You get a chance to share the music you have been working on. - Learning Attention to Detail: You go through the process of fine tuning a piece to the point that you are comfortable singing it in front of others. - Communication Skills: You learn how to truly communicate the meaning of a song in performance. - Memoriziation: You learn HOW you best memorize and truly internalize a piece of music. -Performance Anxiety Relief: The more you perform, the better you learn to adapt to your body's response to nerves and therefore the easier it gets. -Your Happiness: You did it! It felt good to sing in front of others! You saw your mom smiling and your dad clapping for you! Your teacher was proud! -Hearing others voices lifted in song: It is so good to hear and watch others singing. You are exposed to new music or hear an old favorite. You get to see the joy others have in singing. You may hear a song you know you want to sing in the future (tell your teacher). -Historical and Cultural Understanding: You learn the history of the song you are singing, the culture of a variety of different styles of singing, and learn from others performances. -Community: It is part of the community of the voice studio in which you take lessons. Be a part of it as you learn something from every performance. 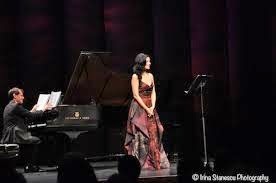 -Preparation for the future: Singing 1 or 2 songs on a group recital now prepares you for a future recital that is just yours or singing a solo song in the next musical theater production. -It is fun! Admit it, even if you are a little nervous. There are few reasons not to, but if you are brand new to the studio and in the beginning stages of voice lessons, maybe you forego this performance. If you have had a recent vocal injury and are taking voice lessons to rehabilitate your voice. Attend the recital anyway to reap the benefits of listening to others doing the same thing as you and to meet others in the studio! You love to sing, so go out and do it! Happy Singing! I enjoyed visiting and reading their content!